Last year I did a simple flower braid (with my blue hair!) that was really easy, but I recently found an even easier way to do this style that I had to share. 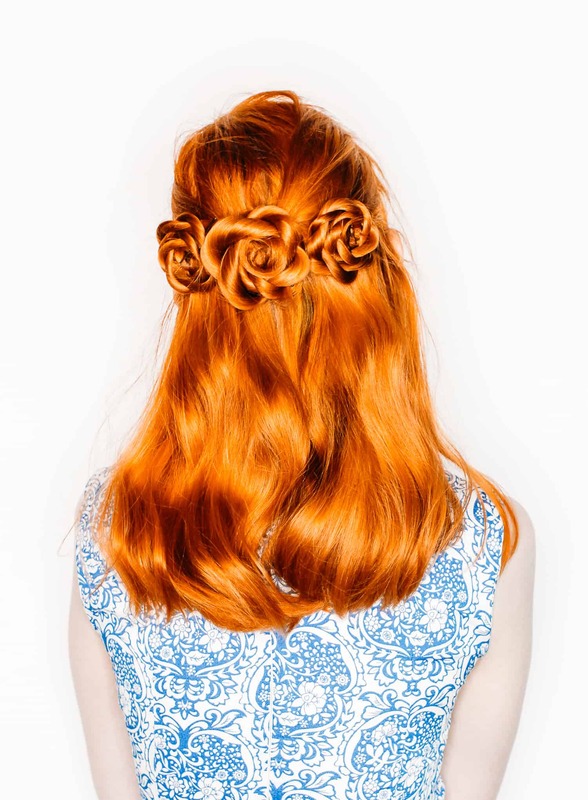 It’s perfect for everyone who loves flowers, braids, flower crowns, and hairstyles that look a bit complicated but actually take seconds to achieve. It’s also a chic half-up do that you can achieve with almost any length of hair. Step One: Separate a small section of hair towards the top of your head into a small ponytail with a clear elastic. You really don’t need to tie off much hair at all! Step Two: Divide this ponytail into two even sections. Step Three: Twist both sections in the same direction; I twisted both of my sections to the right. Step Four: Twist the sections together in the opposite direction; since I twisted each individually to the right, I twisted them together to the left. This makes a simple rope braid. Step Five: Twist to the ends of your hair and tie off with a small elastic. If you’ve done your rope braid right, the twists will hold together on their own. Step Six: Take your rope braid up and spin it around itself; I like to place the end of the braid in the center and curl the rest of the braid around that. Pin in place with a couple of bobby pins. So easy right? And it looks like a little rose! 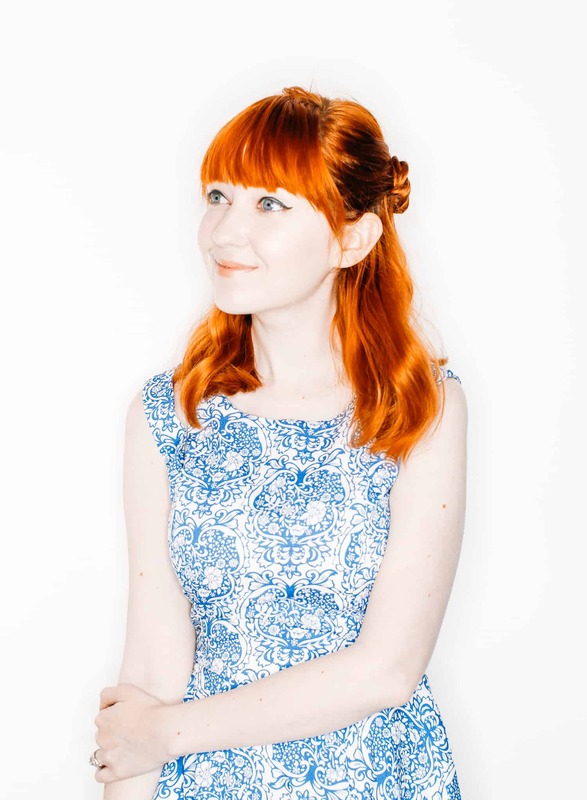 I love how you don’t have to use much hair at all to create this style so you can still have a full look with the hair left down…in fact you use so little hair, why not double or triple the look up? For an alternative styling technique, why not make three small flower braids? 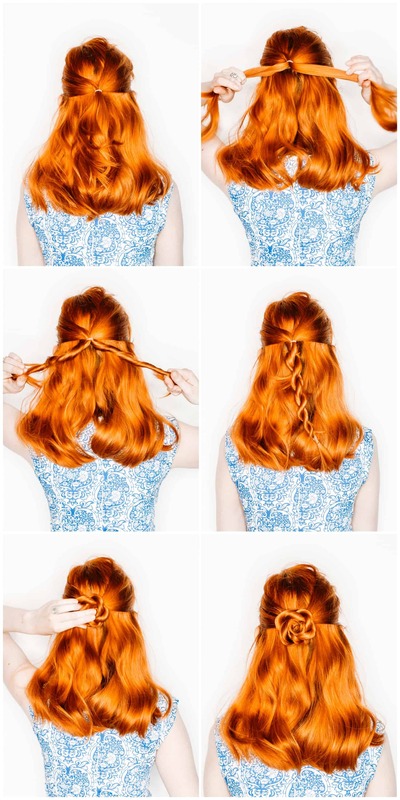 You don’t need to start by tying off a small ponytail at the start for each of these. Instead, I just grab a small section of hair on either side of my original flower braid and make a couple of quick rope braids. 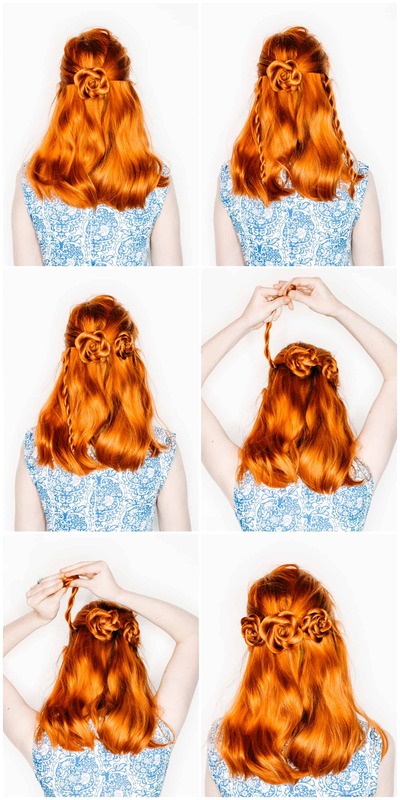 Tie them off and pin them up exactly the same as your first braid, and voila! A braided flower crown! Here’s what the style looks like from the front; just like a little half-up look with maybe some “fun buns” in the back. I really like this style right now, and it’s giving me so many ideas on other ways to style it. Like, when my hair is longer, can I make one giant flower braid on the back of my head, like a flower bun? Or would this look fun if instead of doing my flower braids beside each other, I stacked them on top of one another—like a flower braided faux-hawk? Cheers, Rebecca. This is so cute, and just right for my hair length right now. And I have the same fringe as you! Hopefully it looks just as good on my black hair! How beautiful they are, wow! PS: Where did you get your social media icons. Trying to make some for my site but the coding though. This is so cute! I love it when hairstyles look more complicated then they really are. That flower bun is so cute! I never would have thought that it was that easy to accomplish this hairstyle! This is so cute and fun, and a great style for any special event this summer. Unpopular opinion – I personally dislike messy half-up buns that are popular right now. I prefer my hair on the sleek and kempt side. But this? This is my kinda thing. I’ve done small rosette type things in the past to the side of my hair but this is a beautiful half up style. Can’t wait to try it! The half-up/half-down look is one of my favorites. They’re wonderful for casual and formal events. I have a wedding coming up and this look would be perfect! Ha ha, I know! People always say easy and then it isn’t that easy, but I try to only use it if I mean it! It’s funny though when I show people the finished style and I say it’s easy they never believe me! You’re hair’s wonderful ! Love your post! WAIT WHAT! When you said ‘easiest’, you really did mean easiest! I will definitely be using this technique! I had to come back and comment, because I NEVER know what to do with my hair. This took me, what, three minutes on my first try? I can’t even do a normal bun. Love this! Looks like I can try it for myself. I’m going to use this for my 12th birthday! My two BFFs are coming over and I really wanted something pretty but simple and this is honestly perfect. I love it!! !